One of the great things about Rough Rider Knives is the way they take something old and make it new again. Sometimes they go even beyond making it new, again. This is the case of the Locking Canoe-Whittler. While people have made canoe- whittlers (canittlers) in the past, no one has ever made a Locking Canoe-Whittler! Sure it is a simple concept. And as of this writing no other company is making one to date. There is only one place to get this pattern, and it is on the Rough Rider line. And regardless of who makes it next, the grand daddy of all future locking canoe-whittlers will be the Rough Rider Locking Canoe-Whittler. Obviously, being the first to come up with a knife design is kind of cool but I'm sure we've all seen knives with weird blades or strange handles or fancy new designs that, well looked cool but lacked any real insight or value. It take more than being first with a new design to actually be impressive. The knife needs to be functional and well made. It needs to appeal to the targeted user. It should be affordable and it should be able to accomplish the task it was designed to do.. When it comes to the locking canoe-whittler, Rough Rider has accomplished met all of these requirements. The idea of using a canoe frame for a whittler is not a new idea. By using a canoe frame you allow for wider blades some other frames. Unlike a sleeve-board handle both ends are the same size which allows for a more positive grip and also allows for wider secondary blades. Unlike the cigar whittler the main and secondary blades normally don't open to a full 180°. Instead the blades open at a slight arc which gives you more leverage when whittling. The canoe with its spear and pen blade has also been a popular knife among whittlers so it only made since to add the most popular secondary blade among whittlers, the coping blade. 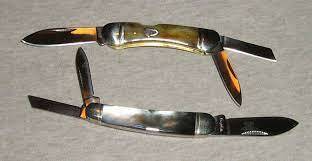 By doing so, Rough Rider has given the whittler the most popular blades around, the spear, the pen, and the coping. The Spear allows the whittler to roughly shape items, the pen gives the whittler a nice detailing blade, the coping allows the whittler to easily scribe as well as do other types of detailing. The Outdoorsman Locking Canoe Whittler compared to Rough Rider's Sleeveboard Black Pearl Whittler (RR 419) . The Sleeveboard lacks a split back spring and relies on two tapered springs.to the Lock-backs three springs. The Sleeveboard is a full 3/8 inch longer yet the has the same length blades. Secondary blades are not as thick on the Sleeveboard. Comparative sizes of a full size Rough Rider Canoe (RR 1062) to the Red Jigged Bone Canoe Whittler. The blades on the standard canoe are about 1/4 inch longer while the frame size if a full 1/2 larger. While the standard canoe operates with two back springs, it also lacks a spacer between the springs which increases the risk of blade rub. 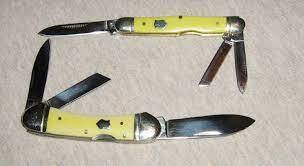 Rough Rider's Yellow composition 3 inch Gentleman's Whittler (RR 891) compared to the 3 1/8 inch Lock-back. Note the comparative width and sizes of the blades. Despite have a split spring design, the blades on the Gent's knife are decidedly shorter, not to mention much slimmer. To recap, Rough Rider has given a wider frame, allowing for wider, stronger blades that open at a slight arc, and have provided ideal blades for the whittler. Just to bring back all this for the whittler would've have been great but they then went one step further and said "Let's lock the spear master!" 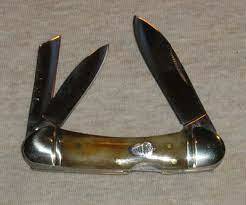 Lock-back knives are nothing new; but the idea of locking a center line blade between to secondary blades is. More importantly most whittlers operate on two springs, with the better whittlers normally splitting the back springs with a wedge. By splitting the springs in this manner, the secondaries operate on separate springs, and then the two springs come together to give a more positive pressure on the main blade (the main blade operates on both springs.) The split back springs allow for a longer centrally mounted main blade to fall between the secondaries without undue blade rub. It also cause the back end of the knife to slightly wider than the front end. In the case of Rough Rider's Lock-Back Canoe Whittler, the wedge is completely dispensed with. Instead, a lock back spring runs the length of the knife with the separate springs for the secondaries mounted on either side. By doing so, the possibility of blade rub is almost nil, and all blades operate on their own spring. By operating the spear master on one locking spring instead of two springs it is not longer a nail-breaker to open. 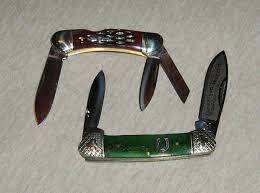 And because it is a lock-back blade there is no longer concerns about it closing abruptly. The standard canoe measures 3 5/8 inches which makes it a pocket full. Most canoes (even expensive canoes) will have certain amount of blade rub. The only way to reduce blade rub is to shorten the blades or add spacers between the blades. Adding spacers increases weight and size and shortening blades reduces usability. In the end, most canoe enthusiasts come to accept a certain amount of blade rub. 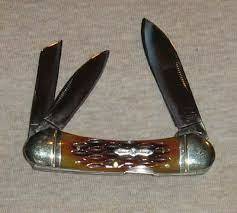 In the case of this knife, Rough Rider has reduced the length by a full 1/2 inch. However, because each blade is operating on its own spring, there wasn't a need to reduce the overall lengths to prevent blade rub. The fit & finish is typical of Rough Rider. The springs are tight; nice single ring nickel-silver bolsters; brass pins and liners throughout. The pins are flush with the handles; as is the shields. Scale wise, the best fit and finish is probably on the RR 1079, the yellow composition. This should be the case, considering it is thermoplastic material than ban be machine molded. All the other scales are bone and require more hand tooling. Still even on the bone handles, the pins and shield are flush. The scales all match up to the bolsters and liners with no gaps. There are no cracks near the pins or anywhere else for that matter. There is one minor flaw when it comes to the springs. The lock-back springs protrudes, ever so slightly when the blade is closed. I did not notice it right away but it became evident when I ran my finger over the springs. The end away from the blade breaks the plain by perhaps 1/64 to 1/32 of an inch. It isn't enough to make the knife uncomfortable to hold, nor is it enough to snag clothing, but it is there. If this is enough for you to skip this pattern, then all I can say is "it's your loss"
A view of the back springs. There are no spacer between the springs. As you can see the lock is fairly far forward which is why it is some tight and should be pushed on from the back. 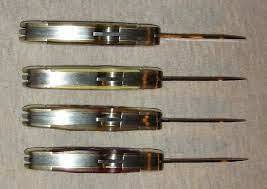 The lock needs to be in front of the center spring pin or the integrity of the knife's structure would be compromised. 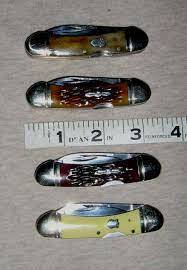 When you open the blades, they stay in place. The pins are very tight and springs are strong so the blades stay in place. The amount of play is the blades is remarkably small, especially on the spear master. 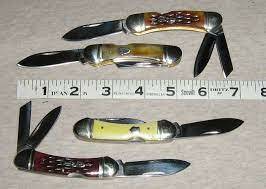 By that I mean it is less than what you find on knives made by Bear & Son, Case or Queen Cutlery. The lock for the spear blade is a little stiff when you try to close the blade. I've found it is best to press down near the tip of the lock with the tip of you finger (the point farthest from the blade) instead of near the center of the recessed area. This ill give you more leverage. Once a minimal amount of pressure is placed, the blade will unlock. All blades open and close smoothly without grinding or rubbing. To date, I have not noticed any lines from blade rub. Blades make a nice positive snap when the open and close. They secondaries talk louder when the close than when the open. My first thought is I would like the locking spring to be a little more flush but in the long run it isn't that big of a deal, especially considering the uniqueness of the pattern. This may be a simple fact of life due to the the way the knife has to be made. My second thought is I hope Rough Rider offers this knife in few more scale options and perhaps in a couples more series. I'd like to see it in black pearl or without a shield. I think it would also like to see it in turquoise. It really should be considered for more series than just the Outdoorsmans. When you have something as interesting and as one of a kind as this knife you should flaunt it. Packaging: Blue denim Rough Rider tray box.